Music feels like our middle name! Music is an important part of B’nai Horin’s services. Rabbi Stan has one of the largest collections of Jewish music and wonderful musicians and artists in the world. He integrates amazing music into each service. 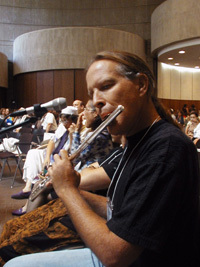 At High Holy Days, the music is live, with our own “band” of professional and amateur musicians jamming together. 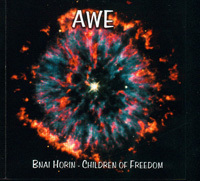 Below you will see an introduction to our CD – Awe, the Music & Musicians and the Artists and Other Performers. Most of them would be delighted to participate in your simchas too. We hope you enjoy reading about them as much as they enjoy participating in our services. We are still working on this section at 7.1.02. Keep checking back for more photos, information, phones, emails and web links. In 2000, we produced a CD of our High Holy Days Music. It is a compilation from our services over the last seven years. Every year we have recorded our High Holy Day Celebrations. Josh Levy has worked night and day to edit those recordings into a phenomenal CD of our unique music. The CD is a terrific way to “prepare” for High Holy Days. It also makes a great gift – for yourself and your friends! To order, fax (credit card orders only) us at 310.475.0309. The cost is $18 (plus $5 shipping, or pick it up at our next event).